PennsylvAsia: Artist Candy Chang in Pittsburgh, May 10. 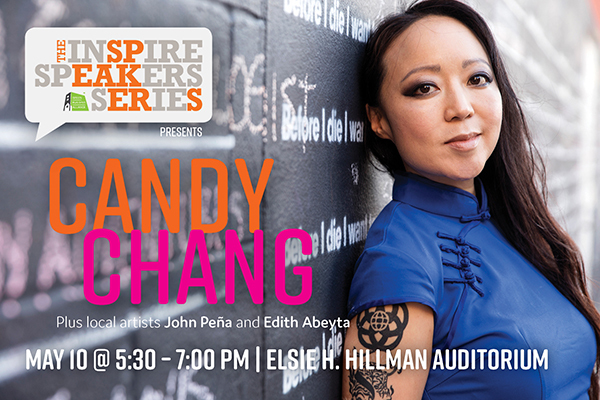 Artist Candy Chang will speak at the Elsie H. Hillman Auditorium in the Hill District on May 10 as part of the Green Building Alliance Inspire Speaker Series. We are thrilled to welcome internationally renowned artist Candy Chang for a discussion at the intersection of public space, emotional health, and community. A leader in participatory public art, Chang engages residents in a reflective process to physically create the fabric of their cities. Her Before I Die piece has captivated citizens in more than 70 countries, including Iraq, China, Brazil, Kazakhstan, and South Africa, with other works featured in the Tate Modern and the Renwick Galleries. The evening’s MC Majestic Lane will also moderate an interactive discussion with local artists John Peña and Edith Abeyta. Candy Chang activates public spaces around the world through playful, contemplative, and often profound art installations. A leader in participatory public art, she is interested in the dynamics between shared spaces and emotional health, the threshold between isolation and community, and the role of the commons in individual and collective well-being. After studying architecture, design, and urban planning, Chang worked with communities in Nairobi, New York, Helsinki, New Orleans, Vancouver, and Johannesburg, where she created low-barrier public experiments to pursue more inclusive forms of democracy. Her recent work, The Atlas of Tomorrow, draws upon Carl Jung and the I Ching to transform a building into a device for philosophical reflection to promote emotional health as a critical component of thriving communities. She was named one of the Top 100 Leaders in Public Interest Design by Impact Design Hub, a “Live Your Best Life” Local Hero by Oprah Magazine, and a World Economic Forum Young Global Leader. She is an international speaker on community, creativity, and emotional health, and her TED talk has been viewed over five million times. The talk runs from 5:30 to 7:00 pm, and general admission tickets are $20. The Elsie H. Kaufman Auditorium is located at 1825 Centre Ave. (map).